Good story. Well connected. Waiting for the third book. I loved the first book, and this one just keeps me hooked. Definitely recommending to ras this series. I'm late in writing up my thoughts again. Bad habit, that. I must get better. Especially when the read was as good as this one was. 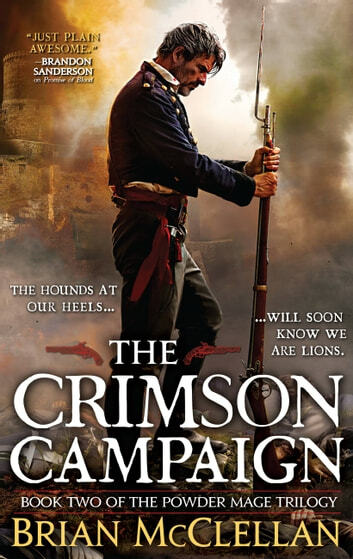 I totally enjoyed my first foray into what they call Flintlock Fantasy with the first book in this trilogy, Promise of Blood, so finally, tired of waiting for this second book to go on sale, I actually paid full price for it. $12.99 for an e-book published 4 years ago. That is SO not me. But I needed to read it! All my favourites were back - well, except the ones the author killed off in the first book! *LOL* Adamat, the police inspector; Tamas, the veteran field marshal; Taniel Two-shot, Tamas' son and powerful powder mage; Ka-poel, Vlora, Bor, Olem... and more. I love the fullness of the characters, not a one is totally light or totally dark. They're nuanced and believable. The setting is richly drawn, the atmosphere alive and the world-building nothing short of remarkable, IMO. The plots are intricate, be they the big over-arching ones or the small, private ones. Brian McClellan is a terrific story-teller and I love the world he's created and the people he's populated it with. The third novel of the trilogy is calling for me as are all the novellas and short stories.